Trying to learn the landscape design and planning trade on my own. Wanting to learn landscape design and planning with a strong ecological focus in a practical, hands on setting (i.e. realizing that I wasn’t getting far on my own). Through a video conference with Ben Falk whilst visiting Richard Perkins’ Ridgedale farm in Sweden! Be humble but brave; know that your Conway education is not a technical one and that there’s much to learn, but have faith in the design method and inquisitiveness the school encourages. And don’t be afraid to approach people with more experience and knowledge of a given topic than you–most people like talking about what they do and have learned (clearly). 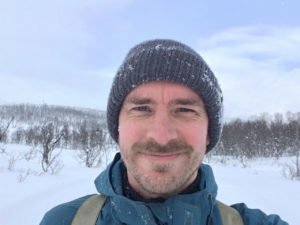 I’m part of a team of three people working to establish a center for arctic food and agriculture based on ecological principles in northern Norway. It’s an allround job where I have to learn as I go along and know enough about a whole range of topics to maneuver everything from writing grants to planning plant propagation to grazing management to discussing building configurations to creating renderings to teaching 6th graders about mycorrhiza to doing dishes after a cooking workshop. And these are interesting times to be in the Arctic. There’s too many, but interestingly, a book about soil was published in Norway at the end of 2017, and it’s managed to provoke a public discussion of what soil actually is. I take that as a good foundation to inform further design and planning. Versatility, plus the ability and willingness to learn is a must, but to me this only works because I have the design approach to work from. Plus, at Conway you realize that you can learn an awful lot in a relatively short space of time, and that it’s OK to take on work you do not already have the answers to. I think I’ve become quite focused on design as a process, and that that process is the backbone of trying to find appropriate, holistically grounded solutions to problems that are site and context specific. And I always hear Ken ask “But what does that actually mean?” after every word I write. Thanks, Ken. What should we have asked you in this form that we haven’t? Is there anything else you would like to share? Where were most of those orca scenes in Blue Planet II filmed? Outside of Tromsø, of course!